Arthur Underwood was born Arthur Bell Percy Wilson in 1885 at Dunkeld, a son of Annie Frances Beatrice Wilson. Annie’s parents were George Wilson and Bridget Quinlivin and she was born in 1864 at Hamilton. At some point after Arthur’s birth, Annie married Henry George Underwood. From the birth records of Arthurs siblings, it seems the Underwoods moved around somewhat with birthplaces from Coleraine to Terang to Winchelsea. The family also spent time in Bendigo, with newspaper reports during the time of Arthur’s war service suggesting he was educated there. Tragedy struck the Underwood family in 1901 when Annie died of Typhoid from drinking tap-water at their home in Golden Square, Bendigo. Seven of the children were also hospitalised. Either he did not get sick or Arthur was not living at the property. He was sixteen at the time. The following year, Henry Underwood died at Hamilton. From his teens until he enlisted, Arthur Underwood lived in varying locations. He was well-known in Bendigo as a choirist at St Paul’s Cathedral and as a member of the Bendigo Deutsche Liedertafel. He was also known for his cornet playing and was a member of the Hamilton Brass Band. His occupation on his attestation form for enlisted was recorded as wine and spirit merchant, having served an apprenticeship with a Messrs. E.W.Pease and W.Richardson. Arthur first appeared on the Electoral Roll in 1909, and was living on Mill Road, Hamilton, his occupation grocer. By 1914, his sister Winifred, born in 1891, was also on the Electoral Roll and living at Mill Road also. It is possible that Arthur was away from Hamilton during that time because newspaper reports also mentioned he worked in the Pacific on the steam yacht of Sir William Lever. Sir William Lever was a soap manufacturer who set up coconut plantations in the Solomon Islands to harvest coconut oil for his soaps. At age twenty-six, Arthur became one of the first men to serve during WW1, after he enlisted with the Australian Naval and Military Expeditionary Force in August 1914 in Sydney. 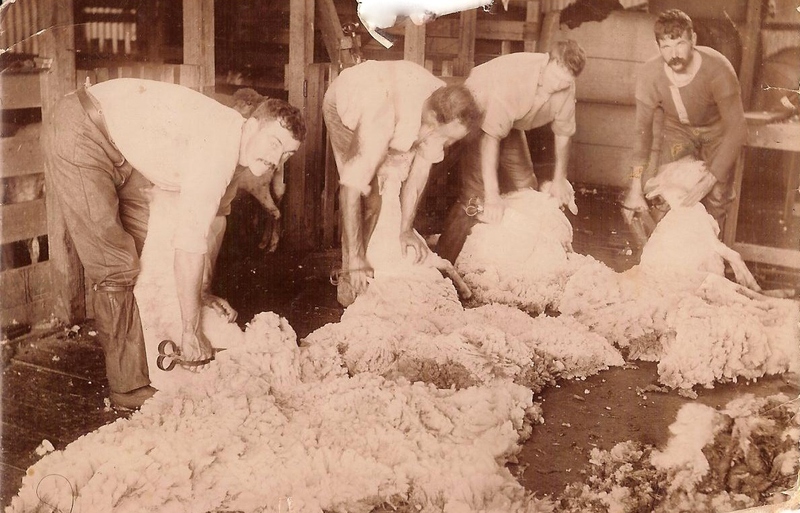 Either Arthur travelled to NSW or was living there at the time as only men enlisting in NSW were accepted into the Military Expeditionary Force while the Naval Force recruited only from Victoria. Arthur embarked for New Guinea on 19 August 1914 and remained there for six months after which time he was discharged. During the time Arthur was in New Guinea, his brother Lawrence Claude Underwood enlisted with the 7th Light Horse on 29 September. He left the ship at Albany and deserted. Another brother Rupert Roy Underwood enlisted in December 1914 and left for overseas in March 1915. After returning from New Guinea, Arthur spent time in Hamilton. An article was published in the Hamilton Spectator on 7 April 1915 about Arthur’s visit along with the mementos he brought back from New Guinea. 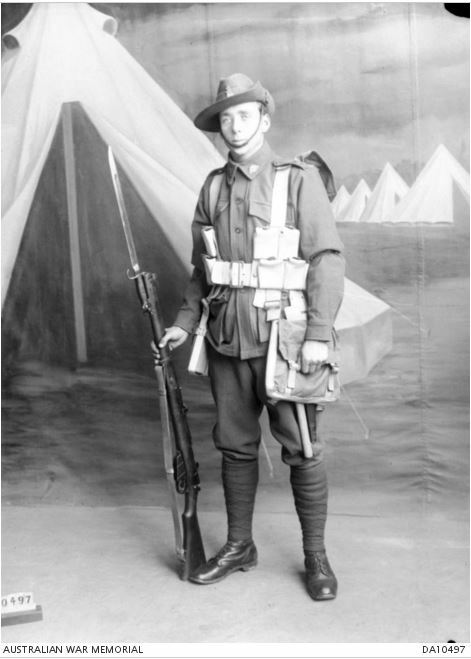 To serve again, he had to re-enlist and went with the 23rd Battalion to Egypt in September 1915. He arrived with the rank of Sergeant but asked to go back to Private to join the band. He went to France during March 1916. After the events of 29 and 30 July 1916 at Pozieres, Arthur was nominated for a Military Medal for “conspicuous bravery as a stretcher-bearer in rescuing wounded from the German barbed wire in daylight”. He went into No Man’s Land in daylight hours and gave help to wounded soldiers before going back to the allied trenches to gather and lead a party to rescue around twelve wounded men from the 25th and 26th Battalions, wounded in No Man’s Land. The 23rd Battalion unit diary mentions Arthur made more trips than any of the stretcher bearers. Arthur was still a member of the band at that stage. Less than a week later, on 5 August 1916, Arthur was wounded, however the discovery of Cardiac Asthenia, a weak heart, saw him evacuated to England were he was hospitalised for several weeks. He was then employed in the military post office until he departed England on 4 May 1917 and arrived in Australian on 2 July 1917. For the second time during the war, Arthur was welcomed home to Hamilton when he arrived on the train from Melbourne on 10 July 1917. The Mayor, Cr. Moore and Cr. McLuckie met him at the train as did his friends and the Hamilton Brass Band. The Mayoral motor car was provided to drive Arthur home. 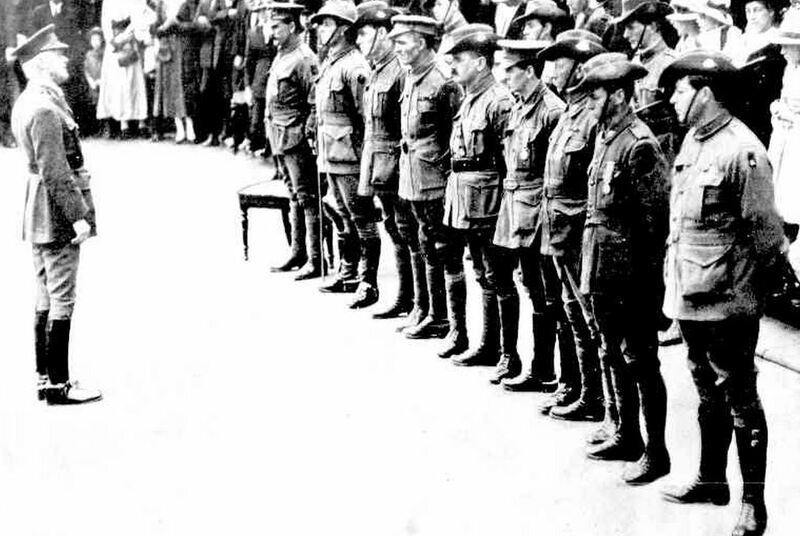 On 7 November 1917, George was in Melbourne to receive his Military Medal from the Governor General Sir Munro-Ferguson. The occasion was photographed by the Melbourne newspapers. “FOR BRAVERY ON THE FIELD.” The Australasian (Melbourne, Vic. : 1864 – 1946) 17 Nov 1917: 24. <http://nla.gov.au/nla.news-article140197590&gt;. “CONSCRIPTION:.” Sydney Mail (NSW : 1912 – 1938) 21 Nov 1917: 6. <http://nla.gov.au/nla.news-article160628847&gt;. After the war, Arthur was living in Armidale in 1919, Toorak in 1921 and Russell Street, Melbourne in 1922 and working as a public servant. 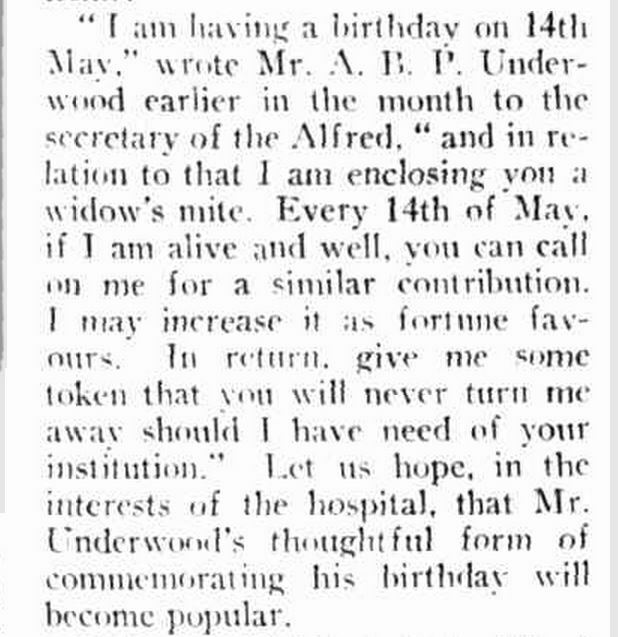 In 1923, he pledged a donation to the Alfred Hospital every year on his birthday for the rest of his life, as reported in the Prahran Telegraph. Arthur was thirty-eight. “FROM “THE ALFRED.”.” The Prahran Telegraph (Vic. : 1889 – 1930) 8 Jun 1923: . Arthur married Emily Scott in 1927 and they settled in Box Hill. He continued his interest in music and in 1938 was elected secretary of the Box Hill Orchestral Society. Arthur died on 13 May 1944 and was buried at Box Hill Cemetery. Arthur and Emily had one daughter, Isobel.